Every mom-to-be is encouraged to write a birth plan: a long list of what you definitely want and what you definitely don't want during your birth. The problem with these birth plans (often reaching 2-3 pages in length) is that they tend to be ignored by doctors, nurses, and even midwives. Sadly, they're a “nod and smile” thing for care providers. They nod and smile when you present the document – then completely disregard them during your birth. 2 What's Your Job During Labor? 6 Sample Birth Plans & A Template for You! Before you get upset with the doctors and nurses, take a minute to read on. See, it's not really their fault that they dump the birth plan. Firstly, a long list of demands never makes other people happy. Secondly, it's not your doctor, nurse, or midwife's job to make your birth fit the mold your birth plan lays out. Their job is to take care of you and your baby during childbirth and postpartum. That's what you hired them for. What happens during your birth is really up to you (I do recommend you carefully consider care providers – the right care provider does make a difference). What's Your Job During Labor? Maybe you think that's a funny question – of course you'll be having the baby! Lie flat on your back and scream out in agony the entire time. Sit on a birth ball and rotate your hips until it's time to push. Stand in the bathroom, lean on the counter, and moan your way through the entire deal. Again, there are a lot of ways to handle labor and birth. Doctors, nurses, and even midwives tend to see a lot of women think that screaming in agony is the way to get through birth. The mom is just “hanging in there” until the pain is done – having a baby is something that happens to her… it's not something she does. So when they see a long birth plan, all they can think is of all the women who came before with that long birth plan. Those women who expected the doctor to deliver an ideal birth and a perfect baby while they sat back and screamed or whined their way through it. That's a hard request to deliver. Your baby is actively working with you during labor. And you can actively work with your baby. Childbirth can be challenging, and believe me, you can end up losing it. You can end up screaming. I've had six babies and a few of them of have been born with what my husband calls my “primal scream” ringing in their ears. I've felt overwhelmed and had moments of self-doubt in labor. It can be tough. But during every single one of them, I was able to get back on track – with the help of my midwife, with Scott's help, or sometimes just having a contraction end and breathing – realizing that I can do this. You can do the same thing (believe me, I am no wonder woman). So what will you do during your baby's birth? How have you prepared to handle labor? Have you taken classes in town? Explored hypnobirthing techniques? Worked on meditation and breathing skills? Signed up for my MamaBaby Birthing online classes? Highlight what you'll do in your birth plan. Think about what's most important to you during your baby's birth. To me environment is key. I want low lighting and I want my care providers to watch and observe without poking and prodding me. In other words, I want them to let me do my thing unless we all realize that there's something going on that needs their help – or unless I ask for their reassurance. You may have different values, and depending on where you birth, you may have different requests. If you're at the hospital, asking for intermittent fetal monitoring so you can use the birth ball, lean on the bathroom counters, and dance around the room may be really important. Whatever it is, put that down in your birth plan, and try to keep it to 3/4 of a page. On the bottom quarter of the page, put how you've prepared and what you'll do to work with your baby during your birthing time. You can also put a few sentences about how you're willing to discuss any interventions or recommendations (however briefly), but that you would like that discussion to happen in a respectful way before the intervention happens. If you're birthing in the hospital, or even at home, you may have desires for your baby. Delayed cord clamping, no hat on baby, baby skin-to-skin on your chest with both of you covered in blankets for warmth, etc. Create your “baby plan” on another page – also as short and sweet as possible. Clean formatting and large text on both your birth plan and baby plan – as well as the assurance that you're proactively going to work to create the birth experience you want – will help you care providers take your plans seriously. And, in the moment when you're having your baby, they're much more likely to read them. Sample Birth Plans & A Template for You! 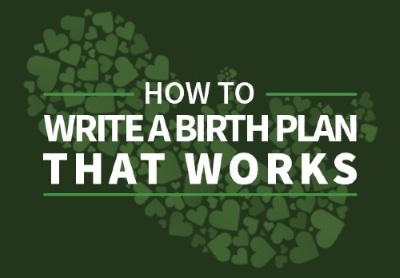 You can find birth plan templates all over the internet. I recommend you look at those for inspiration and ideas, but write out your own birth plan. It may take an hour or so, but it's worth it to have a plan that's you've thought about and made really yours. Plus you can format it in a way that's much more likely to get read. Once you've finished your plan, print it off and take it to your next prenatal appointment – it's a great way to open a discussion about what's important to you during labor and how you plan to work with your baby and your contractions. Take several copies of it and your baby plan with you if you'll go to the hospital or birthing center (some moms get signatures from their doctor and even the head nurse in L&D before labor begins). Okay, now I know what you really wanted: the sample birth plans! Click here to sign up for the newsletter and download your entire packet!